Solar Garden Lamps generate electrical energy by the solar panel and store the energy in the battery during day time and light up the LED to Bright up your garden at night. The main components in the Solar Garden Lamp are Solar Panel, LED light, Battery, Solar Power Controller and the lamp closure body. A Solar Garden Lamp is an outdoor lighting that will automatically bright up at night and light off at day break or when it is not needed. In the day time under the sun shine; the solar panel of the lamp will generate electrical energy which it needs most at night and is stored in the battery. This battery will supply the electricity to the LED light and the solar controller. At night, the controller will direct the electrical energy to Led light so to turn on the Solar Garden Lamp to bright up your garden. 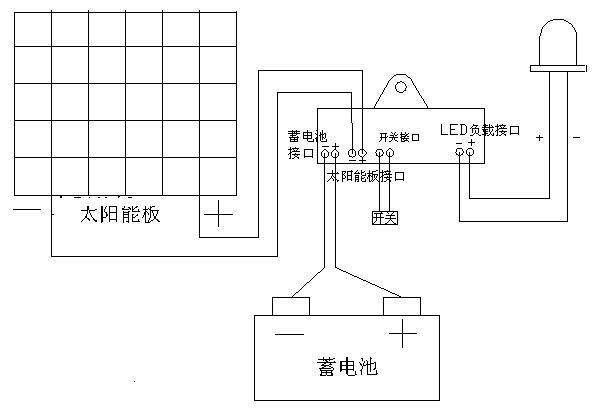 The solar panel, the battery and the solar controller; these three parts are the Solar Power System of the solar garden lamp. Solar Lighting system utilizes solar power to turn on the lighting. Solar Garden Lamp is one type of the solar lighting. The solar panel is the most expensive component in the solar lighting system. Solar panel under the sun light will produce electricity. The solar controller which connected to the solar panel, the battery and the Led light will direct the electricity to be stored in the battery. How much the electricity will be produce per day is depend on the wattages of the solar panel and the time the sun shine on the solar panel. Due to this reason some solar garden lamps may work well in over sea country but would not fulfill what you expected in Singapore. The reason is the sky above Singapore is cloudy. The average Sun shine per day in Singapore is 4.5 hours. If you are looking for a solar garden lamp to bright up whole night in Singapore, the wattages of the solar panel need to be at least 4.3 (rough guild) times of the wattages of the light source. More will be better. Solar garden lamp needs to place at a location to receive the sun light whole day for it to perform well. If it is placed at location under the shadow of the house or the tree, you do know what will happen. If the solar garden light is placed at the location near to a building or house, the size and the location of the shadow of the building or the house will be different in the months in the year. For example, my own HDB house, my balcony is facing the North and the dinner hall facing south. From May to November, there will be sun shine in the balcony and dinner hall will be cool whole day. The solar lamp placed at balcony will work well during these six months. The other six month, due to not direct sun shine, the solar lamp will turn off before time or does not turn ON at all when there is rain. Solar panel (or cells) should be well protected causes it is exposure to the sun and rain. The temperature of the surface of the solar panel will rise to about 60 degree Celsius or higher under hot sun. The material which used to protect the cell must be transparent and do stand the heat. The best material is the Glass. This is to make sure the solar cells can last long (Life Span 20 years). The Solar Panel mentioned above is silicon solar panel. There is another type of solar panel called film type solar panel. At present, Film type solar panels have less efficiency while compare to silicon type. But film type solar panel need not to be under direct sun shine to perform while compare to silicon type which need to have Flux of the sun light around 1000LM per meter square or more to work well. At present the life span of the film type solar panel is much shorter then the silicon type. The battery used in the solar power system is basically same as the car battery. The only different is the way the Ampere of the current supply to the load is different. For example a 12V 20A/H Deep Recycle Battery, it can provide 20 Amp current for an hour to the 20Amp load, it also can provide 1 Amp current for 20 hours to a 1 Amp load. Further more, when charging the battery, you need to know the maximum charging current. Too powerful charger might reduce the life span of the battery. For normal car battery, it is important when fully charge what maximum Amp it can provide and last for 15minutes. There is not data on minimum current it can hold for 20 hours. In general, all the batteries when fully charge and then fully discharge, the life span of the batteries is about 400 cycles. In solar power field, there are batteries which are special designed and manufactured can have the life span up to few thousand cycles. Normally the so called solar batteries are referred to storage batteries. During the design state the charge needed by the load (the whole system) per day is calculated. Then the capacity of the battery can be determine. To determine the capacity of the battery the weather condition of the location where the system sited need to be studied. For example, in Singapore where the Average Sun Shine Hours per day is 4.5 hours and normal longest raining is about two days. The true is the solar system designed according to the condition is work well from February to October. In November to January, there are days that only two hours Sun Shine and the rest of the day are cloudy or raining and it last for two weeks or more. Under this weather our solar system might off early then it supposes to. By increase the capacity of the battery (and the Wattages of the solar panel) might solve the problem but we can not 100% sure it will not happen again. And raining days and hours since to increase year by year (okay, it is my observation). To increase the life span of the battery, we would let the battery operate daily at 65 to 90 % of the capacity of the battery. That means when charging during day time the charge level will not exceed 90% capacity of the battery and so at night the charge level will not below 65%. These functions are all controlled by the solar controller in the solar lighting system. The cost of the solar panel has reduced and the amount cost needed for the battery seems to become more significance. For a solar system that lasts 15 or more years the cost of the battery will be the major (more than solar panel). 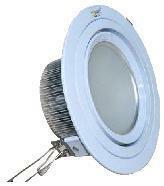 Led light is used here because of the High Brightness, Long Life span, and Low Heat Generated. It will not burn your hand when contacted to the lamp. If other light source is used for Solar garden Lamp, for the same brightness of the Led, the power required to light up will be increased. The result is to have bigger solar panel and bigger capacity of the battery. Please click to read more about Led light. The Solar Power Controller will make sure the Lamp to be 'ON' at night time and 'OFF' during day time. How Controller knows when to ON and OFF the Lamp? There are two methods used, namely light sensor and solar panel. At night time, there is no sun light shine on the solar cell, the voltage at the terminal of the solar panel will be low or near to zero. The controller checks the voltage of the terminals of the solar cell if below certain level; it will turn ON the Lamp. This method is more economical than applying Light sensor. Beside automatic ON/OFF, the controller manages the charging and discharging of the battery. This will increase the life span of the battery. How Controller Increase The Life Span Of A Deep Cycle Battery? For a cycle battery, if it is fully charged and fully discharged daily, it will last only for about 400 cycles. If the cycle is operated daily within 20 % of the full capacity of the battery, say the battery is discharged to 65% of its full capacity (night time to ON the lamp.) and charged up to 85% (charged by solar panel) daily. The life span of the battery will be increased to 3 to 5 times. During charging (day time), if the voltages of the battery reach say 85% of the battery capacity; it will stop charging so to prevent the battery from overcharging. During night time, the battery will supply the energy to the load mainly is to on the light (for Solar Garden Lamp). It is called discharging. Let say after 3 day of heavy rain, if the charges in the battery reduce to say 20% of its capacity; the controller will OFF the light so to prevent battery go into a state of under charge (or battery is over discharging).On that night the lamp will not ON. A well designed solar garden light, every normal day before the night fall, the battery will be charged up to 85% of its full capacity. The over discharge of the battery will not happen. The over discharge will occur when there were not sun light for continuous three (depend on the design) days. The battery under this type of system is referred to as a Deep Cycle Battery. The capacity of the battery is indicated by A/H. For battery that is of 12V 7A/H. It indicates that this battery will supply electrical current of 7A (Ampere) to a load of 12V (Volts) and last for 1 Hour. Let say if the current is only 0.2A, the battery will last for 35 Hours (about three nights). A well Designed Solar Garden light will has a good performance when it is sited at the places where it is design for. The solar panel is the main component of the solar garden light. Solar panel will perform well provides the sun light shine on it can make it generate enough electricity energy to store in the battery which will supply to the solar garden light when needed. The sun light that shined on the solar panel will not be the same at different place. The brightness of the sun light or line that shine on the solar panel need to be 1000LM per meter square then the solar panel (silicon type) will work according to their specification. The average number of hours that the sun light shine on the solar panel of the area per day will affects the performance of the solar garden light. The term is Average Sun Shine Hours per Day. You can find this term is weather statistic web site to know the number for your area. For Singapore it is 4.5Hours due to cloudy sky. 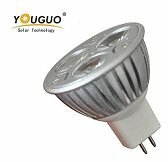 If you have a solar garden light which designed for the 9Hours and used in Singapore, the lamp will bright up about half of the number of hour you are expecting. So far i know, all the solar garden light are designed to place under the direct sun light for the whole day to perform well. If not a special conditions should be stated. Cost of a well designed solar garden lighting is expansive. The advantages it bring to you will make you willingly pay for it when you would like to brighten up your garden. * For normal garden light you need an electrician to connect the line power to the place where the garden lamp placed and the electrical cable need to be bury under the ground level. The cost of these work is not cheap in Singapore. * The quality of the waterproofing of the garden lamp will be deterioted with time. Sooner or later, shot circuit due to rain will happen and trip the main power which will affect the power system in your house. * All the solar garden light comes with automatic ON and OFF. * The light source of the solar garden light is Led; when contacted will not let you get burn. This will make your garden safer for the children. * You can bring your solar garden light along when you go for over night camping. * One of my customer move his solar light into his home at night and out to the garden at day time. 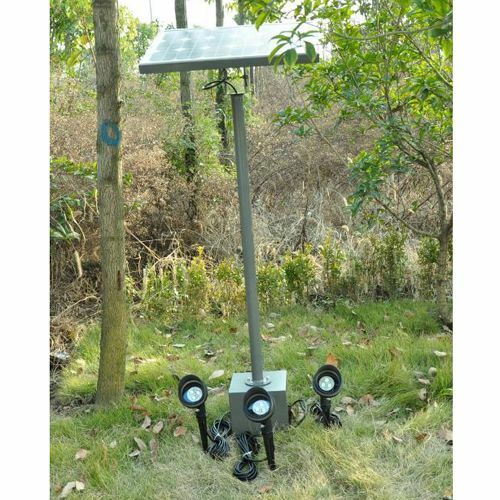 What makes the Solar Lawn Lamp unique from solar Lighting is the Aluminum body of the Solar Lawn Lamp. It is best to make of Aluminium which is anti-corrosive and is powder coated. All the components of the solar lighting system are placed inside this body and the lamp can stand by its own. This make the lamp can be placed at any where in the garden. It is electrical isolated. 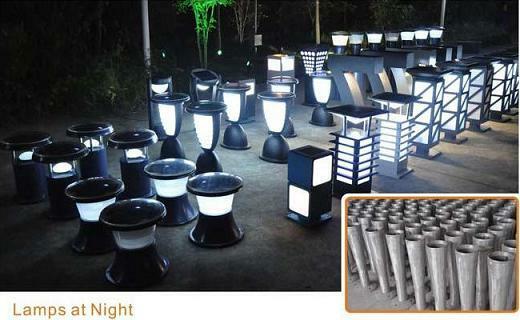 The design and material of this casing will very much affect the price of the Solar Lawn Lamp. These are outdoor solar lighting that go without the enclosed body. This type of lighting comes with number of few meters cables that can let you place the number of led bulbs with waterproof housing to where you like in the garden and within few meters around the post. The solar panel will be placed at the top of the Post which is made of metal. At the lower part of the post a metal box is attached. This box is where the battery and the controller are placed. The cables of the bulbs is connected to the controller. If there is an area with good sun shine and suitable for solar panel(s); the whole solar system can go without the pole and become invisible. * You can bright up number of areas with one solar lighting system. * You can bright up the places which are under shadow that for one body solar lamp which will fail due to not enough sun light in the day time. * This type of solar light is good to shine the tall trees or plants at night in your garden. * For the same light output, compare to the other solar light which is in one body; the cost of the SLK will be cheaper but there will have wires running from the solar controller to the out door spot lamp. Note: All the Solar Light must be placed under direct sun light for the whole day. Then the solar light will work as per design.